TheraBreath® Oral Rinse has been endorsed as a Green Consumer Product by the Environmental Health Association of Nova Scotia (EHANS). The oral rinse product uses natural ingredients and is guaranteed to reduce bad breath, dry mouth and other oral care issues. EHANS endorses TheraBreath® Oral Rinse as a green product that is safe for the individual as well as the environment. People all over the world need ways to effectively take care of dry mouth and bad breath halitosis. Many available products on the market that help with these conditions contain harsh chemicals and may have a detrimental impact on the environment. As a way to aid consumers in making healthy choices, the Environmental Health Association of Nova Scotia (EHANS) created the “Guide to Less Toxic Products”. This guide lists products deemed to be the least toxic and most green. TheraBreath® Oral Rinse was selected and endorsed by EHANS as a Green Product and an environmentally friendly choice for oral health. In order to be endorsed as an environmentally friendly product, HealthNewsDigest.com points out some of the objectionable ingredients that have traditionally been used in oral rinse and mouthwash: alcohol, saccharin, formaldehyde and synthetic colors. These ingredients are not found in TheraBreath® Oral Rinse, which is an all-natural, alcohol-free solution for to dry mouth treatment and bad breath halitosis treatment, but the endorsement by EHANS offers one more reason for the environmentally conscious consumer to select TheraBreath® oral care products. With the positive environmental impact, commitment to natural ingredients and the absence of alcohol in its mouthwash, TheraBreath® Oral Rinse simply works better than many other oral rinse alternatives. When using an alcohol based oral rinse, the mouth will become dry and the level of saliva is reduced. Due to the reduction of saliva, the mouth is not able to flush out bad breath causing bacteria, leading to high levels of Volatile Sulfur Compounds (VSC’s) and a foul odor. This is why an alcohol-free oral rinse may be a more effective and healthy solution for oral care. The Green Product endorsement for TheraBreath® was based on many features of the product, one of the most important being the ingredients. TheraBreath products use natural ingredients such as tea tree oil, green tea and aloe vera. In addition to being environmentally friendly, TheraBreath is also certified kosher, approved for diabetics, free of animal products, is not tested on animals, and is also made in the USA. In addition, TheraBreath® contains no dyes or artificial sweeteners and no other chemicals dangerous to the environment. TheraBreath stands behind all of their products with a money-back guarantee. TheraBreath is able to live up to the high standards of organizations such as EHANS because they have imposed their own high standards to create quality, effective oral health products for their customers. 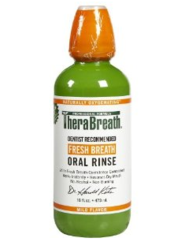 In addition to mouthwash, the TheraBreath® product line also includes toothpaste, sprays, drops, gums and mints. The TheraBreath product line was developed by Dr. Harold Katz. Dr. Katz is a graduate of the UCLA school of Dentistry and holds a separate degree in Bacteriology. He is also known for his expertise in bad breath, dry mouth and tonsil stones. Dr. Katz's crusade began when he sought to help his own daughter with her halitosis and was frustrated by the absence of safe and effective products available over the counter. He founded the California Breath Clinics and developed a product line that has helped many customers and the popularity of TheraBreath has grown to help over a million people worldwide to overcome halitosis and improve their overall oral health. You can be among the many that discovers freedom from dry mouth and bad breath halitosis through TheraBreath products. These products can be ordered securely online at http://www.therabreath.com.